Stitch Printable: Cast-On and Double Cast-On Stitch! I’ve slipped another Stitch Printable into my practically-empty little shop here on Needle ‘n Thread, in case you’re looking for a couple new stitches to learn and something fun to create over the weekend! 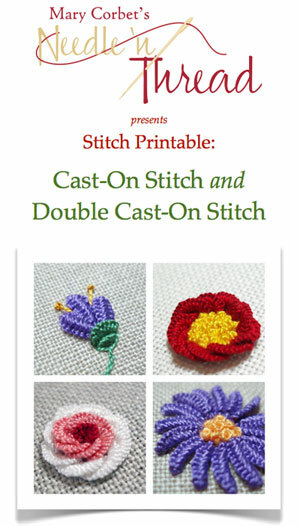 Stitch Printables: Cast-On Stitch and Double Cast-On Stitch covers how to make the cast-on and double cast-on stitches and four flowers using them. The cast-on and the double cast-on stitch are both dimensional embroidery stitches, used often in Brazilian embroidery and in stumpwork. I thought I’d show you what’s in the Printable, to try to entice you. Heh heh. A while ago, as part of the Stitch Fun series here on Needle ‘n Thread, I demonstrated how to make a couple cast-on stitch flowers, using the new cast-on stitch video as a springboard for some fiddling about with the stitch. For the Printable, I’ve expanded the subject a bit, including more thorough instructions than the ones you’ll find on the website, along with step-by-step photos for both the cast-on and the double cast-on stitch (the latter hasn’t been covered on the website). 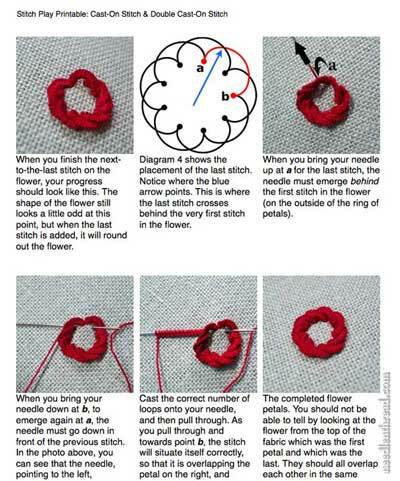 Besides the step-by-step instructions for the actual stitches, the Printable will teach you how to create four flowers with the stitches, so that you can get the hang of how the stitches work while stitching something specific, and then you can play about with the stitches and the flowers to create your own variations. Here’s the table of contents for your perusal. 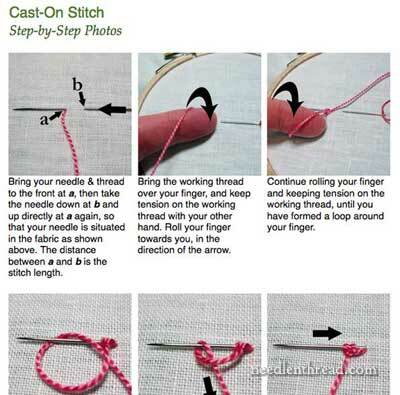 You’ll find clear photos for each movement of both the cast-on and double cast-on stitch. 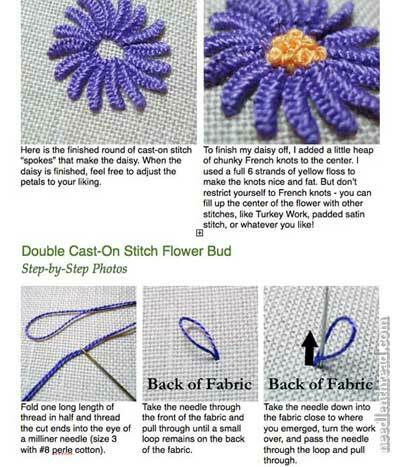 You’ll see how to embroider four flowers using the stitches: a spoked daisy, a bud, a simple flower with overlapping stitches, and a more complex rose out of overlapping stitches. To round out the photo instruction in the Printable, clear diagrams are included to help you along. You’ll also find several “Helpful Hints” throughout, along with information on transferring a design (when you need one – not all the flowers require one! ), and, at the end of the Printable, sources where you can find the materials I use in the tutorial. If you’re keen to have a thorough printable reference for these stitches along with instructions on how to use them to make these four flowers, feel free to drop by the shop! When you complete your purchase, you’ll receive a confirmation e-mail with a download link, so that you can receive the PDF (6.8MB) immediately and get stitching. I hope you enjoy it! For those who like the Printables and have taken the plunge, thank you wholeheartedly for your support of Needle ‘n Thread. I appreciate it so much! Don’t forget that tomorrow, my give-away for a free copy of the RSN Essential Stitch Guide for Whitework comes to an end. If you haven’t signed up for a chance to win this delectable book, hurry up and do it today! You’ll find all the information you need on the give-away page. Look for the winner tomorrow! August 11, 2012 Interlaced Herringbone – Printable Tutorial Available! August 10, 2012 Stitch Fun: Interlaced Herringbone – and Printables? 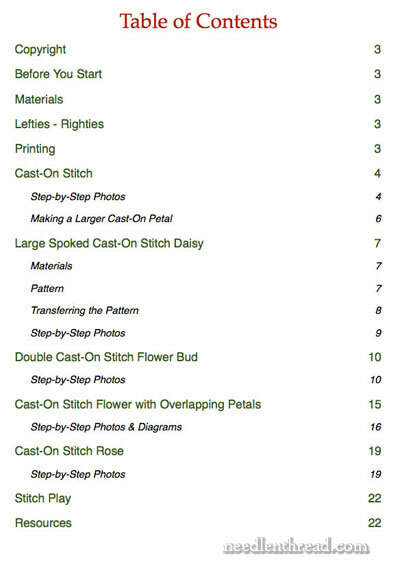 Thanks so much for another stitch play printable E-book which I have just purchased can’t wait to look through the book and decide how I will use these stitches in my projects. They are so reasonable priced and worth every penny. Thank you, Anita! I appreciate your support, and I’m so glad you like the Printables! Happy to oblige, Martine – thank you!! Have just purchased both printables and it is the weekend in New Zealand – one guess what I will be doing this weekend!! Thanks, Oriel! I hope you have fun with them!! These are very good… I am really interested, and these are very easy to learn which you explained in detail…. Vc é maravilhosa, tem mãos de fada. Gostaria muito de ter metade da sua habilidade . Bjo. how a user can be aware of it. So that’s why this article is great. Thanks! Next Next post: RSN Stitch Guide on Whitework – Winner Announced!